Fourslide forming is an advanced metal stamping process. Four slide forming machines integrate stamping and forming operations to produce complex stampings. The fourslide process is well suited to smaller parts. 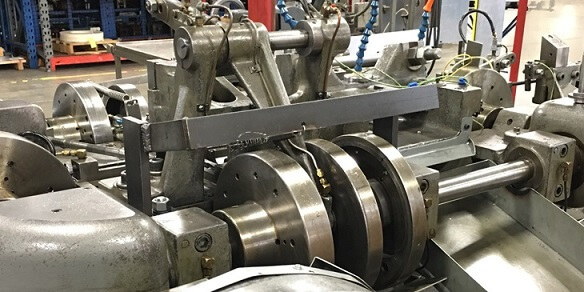 Fourslides are specialized machines built from the ground up to do complex formings and stampings with speed, accuracy, repeatability, economy and ease. But where did the name "fourslide" come from? To understand the word fourslide, you have to understand what a slide is and what slide forming is. A slide is a mechanism to guide a tool - in this case a bending or forming tool - into the right position accurately, quickly and repeatedly and then back out again. Slides are powerful mechanisms built to deliver significant head-on force, and also to deliver that force to the right place, consistently and repeatedly, even in the face of significant side-thrust. In other words, in any meeting between workpiece and tool, the tool isn't going anywhere, and so it's the workpiece that will bend, forming the part you want. The original fourslides had four slides. The four slides were generally arranged in the shape of a plus sign, all moving towards the center of the plus sign in a particular sequence to form the part and retreating to release the finished part. The early fourslides were all horizontal. Very early on, people realized that such a simple scheme was impractical and needed a few more motions. Thus were born the cutoff unit, which separated the workpiece from the rest of the coil of material, and some form of ejector, to remove the workpiece in the (not uncommon) situation that it wouldn't just co-operate and fall on the floor itself when the work was done. Some machines also include a clamp to hold the part steady while the cutoff is cutting the part off from the rest of the strip. So almost from the beginning, fourslides weren't really composed of four slides but rather six or 7. However, the four major ones, all symmetric, were the major distinguishing sign of a fourslide, and so the name stuck. No one refers to them as six- or seven-slides, although that is in reality what most of them are. Later, press sections were added to fourslides, and as a result, some people now call them fourslide presses. The presses on an original fourslide are strange - they operate horizontally. This causes a number of problems, not the least of which is the fact that gravity continues to run vertically, not horizontally, and so the slugs aren't easy to get out of a horizontal press. a bigger machine still has a footprint comparable to the original fourslide.